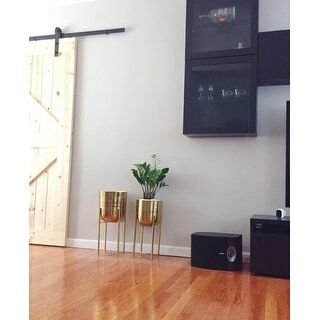 Purchased for daughter's apt and they are beautiful! 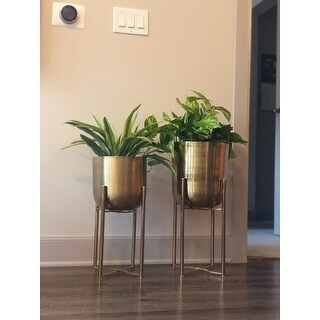 Large, Round, Indoor/Outdoor Metallic Gold Metal Planters in Gold Stands Set of 2 - 11" x 22" & 10" x 19"
Large Modern Metallic Gold Metal Planters with Stands Set of 2 - 12" x 46", 11" x 39"
Give some gilded love to your home with this pair of tall, metallic gold planters in gold metal stands. 100% iron construction means lightweight, durable, and safe from the elements when placed outside! Deep, round planter bodies will beautifully display your pothos plants, as the tall height of the frames will let the leaves cascade without crowding. 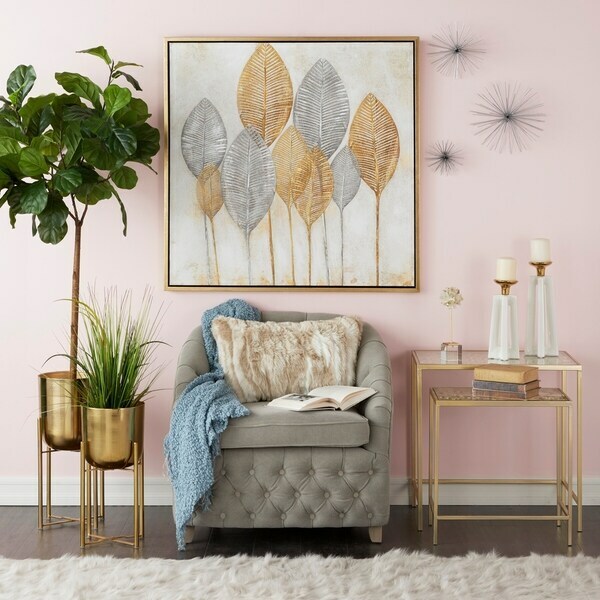 Neutral yet stunning metallic gold finishes complement any pattern or color palette while adding some pizazz to your indoor or outdoor sanctuary. 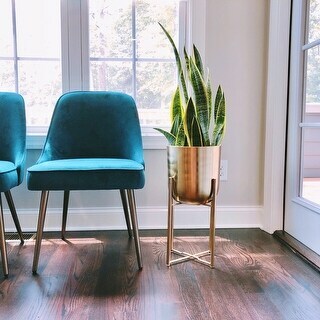 These glam plant stands are AMA-ZEN. 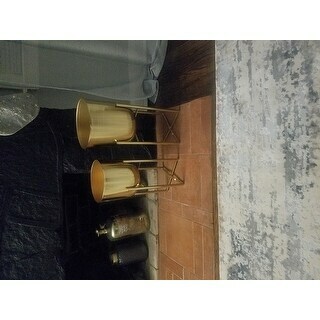 ◦Pair of round glam gold planters in tall metal stands ◦Solid iron construction, made in India ◦Monochrome metallic gold finish throughout tall, round bodies and 4-way frames ◦Set of 2 indoor and outdoor planter stands measure 11"L x 11"W x 22"H and 10"L x 10"W x 19"H; collectively weigh 6.8 lbs. 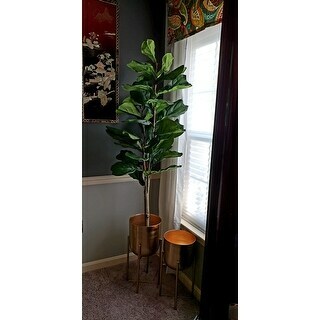 ◦Indoor/outdoor friendly, so display your favorite greenery at your front door, living room, bathroom, bedroom, patio, or deck! No drainage holes. Dimensions 11.0 In. X 11.0 In. X 22.0 In. Check the measurements because these planters are not very large. Package carefully, they arrived in perfect condition. Beautiful golden tone; these are a great purchase. 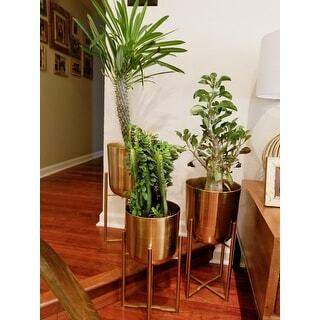 Set of 2 Contemporary Gold iron planters with stands has been a great purchase. 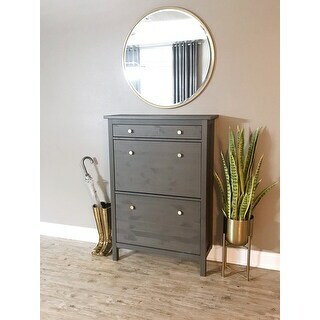 I have searched for a set that would fit my decor, I've even shopped in various physical stores. What I found in the stores were much smaller but more costly. The size of these planters is far larger than I expected. I'm very pleased with planters and the very sturdy stands. The stands has sizable legs that gives prominence to the appearance of the set. I'm very pleased with the color of the gold iron, it's very striking and appealing I'm just very pleased with what I have received. I would highly recognize this product for a contemporary theme. I celebrated birthday October 4, this product was a birthday present to me. 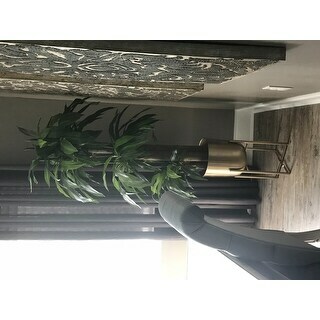 I would rate this product at 100 % I'm so very happy with my planters and stand. The pots are large enough that I can place an already potted plant inside so that this plant has a new look. At this time I'm considering ordering another set because I'm so happy with my purchase. So lucky I found these. 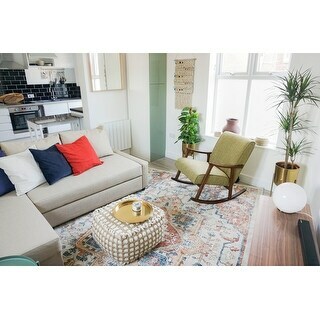 Great quality and material that adds a subtle touch of fancy flair to our mid-century modern decor. If you're thinking about buying them, do it. These are exactly what I was looking for. I purchased two sets as I wanted to display three together. Very happy with my purchase! I can't even believe how beautiful and substantial these are! I wanted to order them for myself first before I ordered them for my clients and I'm about to order 4 or 5 more sets!! they are much larger than they appear LOVE!!!! These planters are an attractive and convenient pair. And so easy to set up- you just open up the folding legs and set the planter in. Too easy. I have to say that the items did not arrive perfectly though. When the box arrived, it was obvious that the box had been opened and resealed. The address label was placed over one that had been cut out and enclosed inside was a packing slip in someone else's name and address. It appeared to be a customer return and I concluded this due to the condition of the larger planter as it had a significant ding/dent in it. Being the person that I am, I decided that the dent wasn't so bad to bother with dealing with the hassle of returning the planters. I knew that I could bang the dent out with a rubber mallet, which I did and it's fine now. I will keep them. O.co, although I do like the planters and have decided to keep them, please ensure that packing slips contain the correct customer information. It was disturbing to find someone else's name, address and order number on a packing slip sent to me. Stands are sturdy. Pots are nice and deep. Pretty gold color. Beautiful planters and stands. The quality is worth the price. 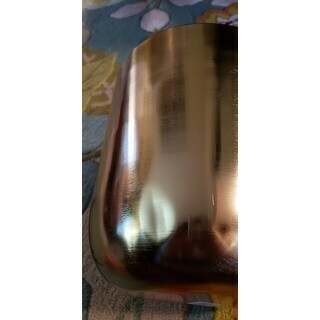 They are a great gold color without being overly shiny and very sturdy. You will not be disappointed. Attractive and easy to assemble. This set is exactly as shown on the site. The bigger one has obvious circular markings running through it but overall they look pretty. Great buy. Great price. It’s so pretty and modern!We love it! I love them thinking about ordering 2 more eventually. They look really good... One if them I am using for project to turn a tray into a table. It should work beautifully. I really love my new planters. They look great! Gorgeous sturdy planters that provide a very high end look. 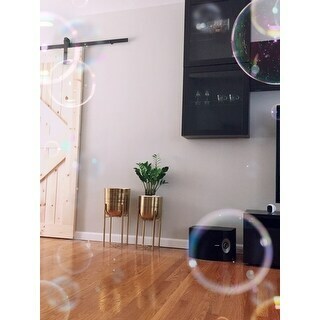 They work really well in my living room. Pots are wide enough for most large sized house plants. Would buy again. These are smaller than I thought they’d be, but they are beautiful and have been beautifully hand made! 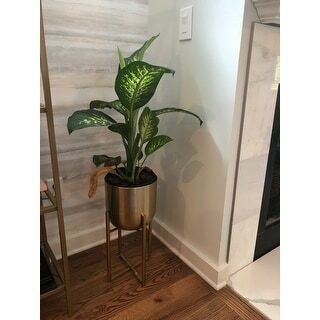 I can’t wait to find the perfect house plants to place in them. These planters are absolutely beautiful, they look so elegant and really stand out! I really like this set of planters. The shiny gold looks nice in my black and white kitchen with touches of gold. I like having my plants up off the ground. It makes watering and taking care of them easier for me. They are a classy addition to my home! Love these, I put Christmas twig trees in them on my back porch and they really dress the pool area up! Not to big or to heavy, just right! Will use them all year round. 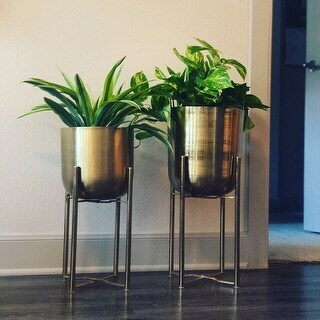 Love my new planters. Sturdy and just as pictured! "Can I use these with live plants? Are there already holes for live plants"
They don't havewholes in them. I have them outside in a Texas heat with Beautiful artificial flowers. "Can I put live plants directly in the planter or do I need some sort of lining? I'm worried about the inside rusting. " I really don't think you should live plants in there. "How high do the plants sit off the floor? Basically what's the height from the floor to the bottom of the pot?" "What is the Height of these pots without the stands? So just the height of the pot itself. THANK YOU!!!!!" The larger one is about two feet off the ground and the smaller one about a foot off the ground. 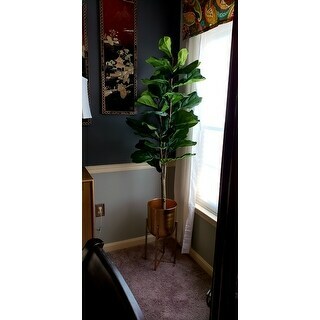 Purchasing for plants I purchased for my family room. This item isn't designed for outdoor use. "What is the width of the mouth of pots & height from floor to top of planter?" The mouths measure approximately 11 inches and 10 inches wide and the height is approximately 22 inches and 19 inches. 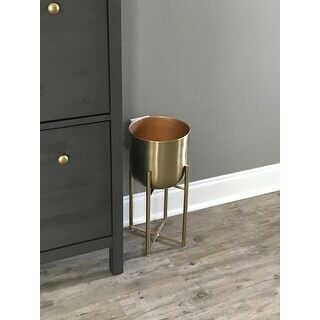 Best Places for Outdoor Planters from Overstock.com. Our guides provide customers with information about the best places for outdoor planters. 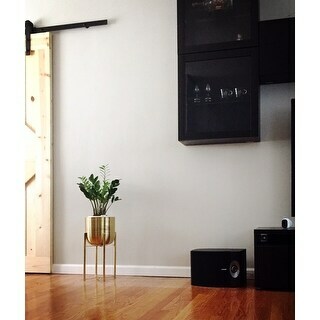 Large, Round, Indoor/Outdoor Metallic Black & Bronze Metal Planters with Stands Set of 2 - 11" x 22" & 10" x 19"
Large Modern Metallic Silver Metal Planters with Stands Set of 2 - 12" x 46", 11" x 39"
Large Modern Metallic Black Metal Planters with Stands Set of 2 - 11" x 46", 10" x 39"